A smashing bay filly , with a great temperament. She is developing into a great middle weight competition, sport horse. Ideal for riding club, 1 day eventing etc. She has a nice action and is very focused when being worked, with 3 good paces. She is a good traveller, hacks out alone or in company roadwork or open country. Good in traffic. She has been professionally backed and is now being ridden on by professional event rider Louisa Lockwood. She has been in the money 3 out of 4 times when BSJ jumping her first winter and has completed a season of eventing, starting at BE100 getting 14 foundation points in 5 events. she then went onto novice and gained a point at Stonah first time out. This was followed by a midseason 'blip' at Tweseldown when she was bitten by an adder. After an enforced break she went on to gain a total of 3 novice points, with a very strong finish, coming 9th at Aldon International in late October. She has had a few weeks rest and is now in her 2nd eventing season. 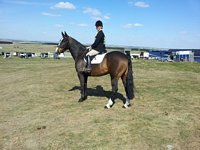 She started with a B100 at Goring Heath, a double clear but unexceptional dressage score put her in 13th with 2 more foundationation points.A novice class at the South of England resulted in 24th place after an uncharacteristic 2 jumps down in the showjumping. Next came Bicton, when a good dressage test was followed by 1 pole down in the SJ was followed by a crash in the water jump XC after wich she was retired she was at that point heading for a likely 3 or 4th place.A short lay off to allow a grazed knee to recover then she went to the new, very nice but rather damp Farley Hall.She came 3rd in the Novice section C for 4 points with a dressage of 32.5 and 2.8 sec time penalty on the XC. A very pleasing result She is much more calm and settled at the events this year, so we are beginning to see how she can do. I will be putting a link here very soon for some videos of this years events. We hope she will find a new home for this season.